Great quality and beautiful look! I bought this to give as party favor for my baby shower. I love it and the guests also loved it. Presentation is lovely. Quality is great. Affordable and unique. Perfect wedding favors! Functional too! PERFECT NOT SOMETHING TO STORE AWAY.. ALREADY USED..EXCELLENT FOR FAVORS. The measuring spoons had cutie sayings but also accurate measurements. Our guests were delighted with the favors and said the will definitely be using them in the future. These were the perfect bridal shower favors. Until I received them, and found that some were poorly made. Beau-coup told me to go through them and let them know which needed replacing, and refused to quality check them themselves, and send me new ones. I had to go through each one of them to find good ones, and then put them back together again. That was no easy task. Do not order these. Is a great bridal shower favor! Is a useful gift,attached to a plate of cookies.I loved the way the spoons are packaged. Just arrived, excellent service in 3 days. I am very happy with product. The quality is good and they came in a neat box. I will be ordering again! Fast shipping! Clean and complete order! This is a product people can use. Handmade things take a lot of time and really not used or appreciated. Time saver! I had a "love" theme for the shower game prizes and wanted the the measuring spoons for your Scrached off game, but when I opened the package I thought the edges of the spoons weren't finished off very well and the last spoon did look a little tarnished. It still is a nice memento. The package was darling with the ribbon. We used these for prizes for the games. Everyone loved them. At the price we ordered extra for the bridal party and close family. I don't normally rate or give feedback on items that I buy online but I have been MORE than satisfied with this product and the company! I bought the heart shaped measuring spoons for bridal shower favors and attached two of the bride's favorite recipes. The spoons were a huge hit! They were packaged nicely and are of good quality! And who doesn't need measuring spoons!! I didn't have an accurate headcount on the number of guests who were coming and Beau-Coup returned the remaining spoons completely hassle free. We used this as a giveaway and everybody loved them! We are giving these to the ladies that come to our Tea Party. Our theme is a Working Hands theme and we will be wearing aprons! These measuring spoons are a perfect give away gift! So glad I found these on beau-coup. of measuring spoons. Delivery time for the shipment was very fast. Big hit! Everyone was impressed. I coordinate women's dinners, brunches and retreats for my church. I always like to have something nice, cute as well as useful as take-a-ways. I got these measuring spoons as a momento, take-a-way for a Ladies Brunch. All the ladies were so impressed to get such a meaningful, useful momento. They were package so nice, all we had to do was place them at the table place settings. I previously purchased bottles of lotion from Beau-Coup for a dinner. That was a big hit too. Product is exactly as described. We will enjoy giving these out! Don't like the box or ribbon that it is packaged. Too flimsy. I ordered the Heart Shaped Measuring Spoons for my future daughter in law's bridal shower. I was hesitant to place the order only because I had procrastinated and had one week to go before the shower. Beau Coup gave me a ship date for 5 days after I placed the order, and sure enough, the spoons arrived as stated. They looked like the picture shown and I was very pleased with the quality. The spoons are packaged very nicely and tied with a ribbon that had to be re-tied on a few of the packages. I highly recommend this product. All of the attendees at the shower were so pleased with the favor. It was a big hit! These will be one of our favors for our wedding. I wanted something people could use time and time again. These are perfect! I used the product for favors for a bridal shower. They came all warped and in nice boxes. Who doesn't need an extra set of measuring spoons. Stainless steet always lasts. They will always remember where they came from. These spoons were a great choice of a favor for my daughter's bridal shower. Everyone thought they were unique and a very useful gift to thank them for sharing in this special event. I was thrilled to open my order and see the useful yet lovely heart measuring spoons so beautifully boxed. I love hearts so I especially loved giving this functional but unique item to my future daughter in law. Liked it so that kept one set for myself! These measuring spoons will be a reminder of my daughter's wedding for years to come. One of her friends received a set as a wedding present of her own and told me how great she thought they were. They should bring smiles each time they are used! I purchased these with the approval of my sister/MOH (since she was hosting my bridal shower), for our thank you gifts as our guest was leaving my Bridal Shower Brunch. These were perfect. Each measuring spoon has a cute engraved saying and on the back of each spoon is the exact measurement of the spoon. The box that it arrived in was "so-so" along with the white ribbon tied around the box; we had to fix the bow's before placing in our guest gift bags. We paired the measuring spoons with a custom recipe card (double sided) one side noted a savory and the other noted a sweet recipe to make, using the measuring spoons. This totally fit my theme as it was a retro 1950's house wife. Overall, I would order these again, but, just maybe supply different boxes. Just received these darling measuring spoons. Will be giving them as favors at my daughter's wedding shower. They are very good quality and have such cute sayings on each spoon. The packaging is very nice as well. Black box with clear top and nice white bow. I am very pleased with this purchase. such a practical, fun way to say thanks! Paired with apron for those who were helpful in baking or cooking and it was loved by those h recieved it! Gift wrapped measuring spoons a big hit! All ages were excited to receive a favor. I did trim the ends of the ribbons and fluff the bow before placing on the tables. I could not have found a gift-wrapped favor anyplace as appropriate, inexpensive, easy and fun as this was. Beau-coup was very easy to do business with. I had a few extras and everyone wants them. Pleasantly surprised as soon as I opened the box! All were nicely wrapped and packaged in blue tissue. Each set was nicely prepackaged with a bow and tag. All the guests really liked the spoons, they were a hit! Baking, has a cute factor with the heart shape measuring spoons. These will be perfect for my daughter's bridal shower. I like that they will be useful for the guests and not just something they toss away or store in a drawer. We love the Heart Measuring Spoons. They will be the favors at my daughters bridal shower. Pleased with the quality of the product and the arrived very quickly. I purchased these as party favors for a bridal shower. The ages of the attendees varied from 26-29 years and jumped to 40+, some attendees were from California, North Carolina, Taiwan, Arizona, New York and Canada ...everyone adored it! it was a perfect keepsake for all ages, extremely unique. The quality of the spoons was excellent, very sturdy metal, there are cute little engravings that say cute well wishes "a spoonful of joy" etc etc. There is also an etching telling you the measurement of the spoon. It comes in a great little gift box, I just added an additional gift tag to make it match the color theme, and the ribbon was a little smooshed due to packaging/shipping but thats to be expected. If you're on the ropes about favors, this one will not disappoint! I was so glad to find a bridal shower that could actually be used by everyone. I purchased these to determine if they would make good baby shower favors. They certainly would but we found another gift to fit our theme. Instead, these have made a great prize for the winner of one of the baby shower games. They are cute and memorable, as well as useful. We planned a "Recipe for a Great Marriage" bridal shower and this was the perfect gift to give as our favors. Ordered the heart shaped spoons for a 25th anniversary. The spoons come boxed with the ribbon tied and tag attached. The spoons are not excellent quality so there are a few imperfections on the edges and back of the spoons. But nothing that guests would notice unless they were inspecting very closely. The other downside is that the ribbon comes tied and so the bow ends up getting flattened in the box. Might need some fluffing to look pretty. before. It was a very good value. I think these are great for a Bridal Shower. They are packaged very nice. They are useful and something you could use and wont waste or be tossed away! These are so cute =) I know that my family and friends will love them. it's just adorable and I love the little phrases on each spoon. I ordered these for the bridal shower game prizes. The theme was "Cooking" so they fit the theme perfectly. The spoons are high quality and nicely wrapped. Definitely a hit at the party! Used these as a gift for a game played at the Rehearsal dinner. Linda, mother of the groom! Everyone loved them! Very Cute! [...]Would definitly buy again. A really cute shower favor! I purchased the heart shaped spoons for my daughters bridal shower 2 weeks ago. Everyone loved them. They are good quality for the price. [...]I would definitely deal with this company again :). I did find a little spot on one set but I'm sure it will polish up. We are having a kitchen theme shower for my niece this weekend and thought these would be perfect for the guest favor. [...] we are set with a beautiful gift for guests to remember this special occasion. I love the different sayings on each spoon. They were a huge hit at our bridal shower!! I love it! Giving as wedding favors! This will be part of my wedding favors along with written receipt cards that I will include with a ribbon and placed on the plates. We felt this was an ideal bridal shower favor as it would appeal to all ages of the bride's entourage: mom, girlfriends, aunties, future mother-in-law, future grandmother-in-law, etc. Product was perfect for our bridal shower which had a "favorite recipe" theme. Most people use measuring spoons even if they don't bake. I thought they were cute and usable. I hope bridesmaids and guests at the bridal shower remember my daughter every time they use them!! Perfect for such a beautiful occasion! I used this as a thank you gift for a bridal shower. The spoons were a hit. We used this as a favor for my Bridal Shower and attached to it two of my favorite cake recipes to share with my guests. It was perfect!! The heart shaped measuring spoons were a huge hit. It was the perfect wedding shower gift to give all attendees. The bridal party purchased these measuring spoons to go along with a "Recipe for a Great Marriage" scrapbook that was made at the shower. The bridesmaids had all the attendees write out words of wisdom on recipe cards, which we added to a scrapbook. Very good quality spoons! These spoons exceeded my expectations. They are very nice and of good quality. The only thing that could have made them better would be being able to personalize them. We're giving away this measuring spoons for my daughter's bridal shower. The theme is baking and they're part of an oatmeal's cookies mix kit. They're cute and useful. I loved them! These are really nice pieces. We are very pleased with them and know our guests will be too. Useful and cute at the same time. It's really cute. Great for a thank you gift, thinking of you, or just I love you. functional too. They'll think of you whenever they use it. Comes in a nice clear box with a bow and tag. I had so many compliments on the spoons. People really thought they were special, and liked the fact that they could actually use them too. Plus, they were individually boxed with a bow. The only con I have is that we couldn't personalize them. Wonderful Bridal Shower Gift for Guests! We placed these gift wrapped heart shaped measuring spoons at each place setting at the shower. The guests loved them. The spoons are heart shaped with cute sayings on them, and will be a reminder of the shower event for years to come. I purchased the Heart Shaped Measuring Spoons to give away as a favor to guests at my bridal shower. They are SO CUTE! I cannot wait for everyone to see them. They are well-made and packaged very nicely. Best of all, they are actually USEFUL and won't be something that guests throw away when they get home. I definitely recommend this product for a great favor! [...] Ordered a couple of these to check on quality and suit for a summer wedding. So cute! [...] Only complaint is that the spoons are not sanded and polished at the edges. But the engraving is nice! I did see a similar product offered by another company for more money so I must admit, I was a little nervous about ordering a lesser priced item from Beau-Coup--especially since I was ordering 60! My concerns were for naught. I am excited to see the guests reactions at my future daughter-in-law's bridal shower! I purchased these for bridal shower favors and everyone was delighted with them!!! We used the measuring spoon set at my daughter's Bridal Shower. A friend surprised the bride to be with a hand made cookbook of recipes from all the guests. The spoon set was a perfect choice. They are well packaged. All we did was refresh the flattened bows and set one at each place. Everyone at the Bridal Shower loved the heart shaped spoons. They are of good quality and will absolutely be useful and not sit in a drawer or collect dust. I think that this favor is so cute and practical. It went perfectly with the theme. A perfect gift fit for a kitchen shower! At the shower, we had everyone write down songs that had "LOVE" in the title. The winner received the heart-shaped spoons as a prize. Loved that it matched the theme and was very useful. Used this to measure love. Great take home gift for your guests. These lovely measuring spoons came "ready to give" in an elegant box with a bow and tag that looked like I spent a lot of time on the favors! They were perfect! And the guests were genuinely happy to receive them. Great value for a great product! Everyone loved the spoons with their unique phrases. I know they will be used over and over!! This item made my Bridal Shower "Classy"
I like this item because it is functional & good quality. I previously ordered the wine stoppers for another bridal shower I hosted & received many compliments. The items are packaged so nicely I really did not have to do anything but place them at each table. I have recommend beau-coup to many associates & friends. This favor was both functional and unique. All the ladies at the shower loved them. I did not like the packaging so replaced with a ribbon to match the color scheme but other than that, this is a great favor choice! Great guest gift for our kitchen themed wedding shower !!!! My guests LOVED these functional, fun measuring spoons. They are a constant reminder of our special day for us and our guests. I even ordered extras for people who couldn't make the wedding. They are sturdy and durable. Great Gift for a Wedding Shower! I ordered these measuring spoons for a kitchen themed wedding shower and they were a big hit with all the guests! Unique gift for many occasions! Good presentation. Looked more expensive than cost. Love spoons - great for parents! I used this for a prize at the bridal shower. We did a recipe book for the bride which included recipes from all of our guests. The first guest to get me a recipe won cooking related prizes! These measuring spoons were a cute gift for my guests that was useful and fun. Was just like the picture and I received the shipment in a timely manner. No assembly of the boxes just open and place them on the tables. No complaints! I saw these on the site and knew I had to have them for my Kitchen themed bridal shower. I won a contest so I was able to get some for free and love the quality so I will purchase more! I reccommend them! "Love makes life so sweet. Here's hoping that (Bride & Groom's names) love is beyond measure! Best wishes to the happy couple." Good for Both Sexes !!! Everyone at the Bridal Shower (males included) absolutely loved these measuring spoons. How could you not? Bought these as party favors for guests at my parents 50th wedding anniversary party, everyone thought they were the perfect thank you gift. I will shop with you again! Great price, great item, very practical and also a wonderful keepsake to remember a special day! I bought these for my heart themed bridal shower favours taking place in February and I cant wait for the guests to receive them! I used these spoons as favors for a bridal shower - everyone loved them - some people because they needed measuring spoons, and others who said they would hang them up in their kitchen! It was nice to give a gift that people actually liked and didn't leave on the table when the shower was over! My daughter loves to be in the kitchen. Always making new dishes, desserts, etc. Everytime someone uses the measuring spoons I'm sure they will think of Jen. The guests thought these spoons were great and different. Nice touch. There were spoons from 2 different batches - one had the measurement on the front and the other on the back - it just seemed to confuse some of the guests. I am using the product for a shower gift. Several compliments. Something you would not throw away also dishwasher safe. I will definately buy them again. they were easy to put out on the tables, just fluff the bow and your done, I liked that. The value was there you couldn't buy anything for that price that looked as CLASSY! To coincide with these spoons for my daughter's bridal shower, we asked all invited to include a recipe and then we took a picture of everyone who did.We will put picture to recipe in a book for her. This theme was well received and worked perfectly. "Just a spoonful of sugar"
The phrases on the front are the cutest, and the fact that they have the actual measurements came as a pleasant surprise to all of my guests. These heart measuring spoons were great and especially for a bride on a budget! By looking at it you would never know how much it really cost! I used this as a gift for my bridesmaids. The perfect bridal shower gift! This measuring spoon set is functional as well as adorable! Everyone loved them...They came beautifully packaged and were the perfect favor for my niece's bridal shower. I highly recommend this for any occassion where love is measured!! A big hit with everyone attending. Everyone loved receiving these party favors at a Bridal Shower. I gave these out as bridal shower party favors and they were a hit! Everyone loved them. I saw measuring spoons at other stores but these were twice as cheap and much better quality. The best part was they came all wrapped up! I bought this for my daughters Bridal Shower. I am making a Bridal towel cake and will add these measuring spoons as decoration. Everyone will be surpise. Not only are these measuring spoons functional but they are very cute! Everybody loved them! This was a great favor for a bridal shower with a Kitchen theme. I am very please with the quality and the presentation. Thanks so much! Very impressive! A useful yet decorative product that is very well made and perfect for a bridal shower. Those attending were sure to gather their measuing spoon favor prior to departing the festivities. A big plus was the excellent pre-packaging - from box to table setting. Could not believe the quality for the price. Would definitely recommend this product! Measuring spoons were a great shower favor because the future bride is a family and consumer science teacher. On top of that she teaches most of the cooking classes and her future name is Mrs. Baker! I purchased these for my daughter's bridal shower. I was pleased with the quality. I just wish the Tablespoon and Teaspoon were more accurate in measurement. There is about a teaspoon too much in the tablespoon, and the teaspoon is actually a teaspoon and 3/4 more. The 1/2 teaspoon and 1/4 teaspoon are accurate. I did use these measuring spoons for a recipe I made for the shower and the pumpkin bread came out fine. I guess that is all that matters. We used these as bridal shower favors, with the customized printed tags with the bride/groom's name and wedding date. We alternated with the heart shaped coffee scoop. Guests loved them. These were a success!! Everyone loved the,m and I only received the most positive responses! These are the perfect wedding shower favor. Everyone loved them and asked where I got them. It's something everyone needs and uses, so I know it won't be one of those throw away trinkets that you never know exactly what to do with after the occasion.Thank you so much. A bridal favor you can really use! Everyone that attended my daughter's bridal shower took the measuring spoons home. They all said it would be somethign they would actually use. The heart shaped measuring spoons I alternated with the wire wisk with a heart in the middle on the table for wedding guest favors. Guests loved the idea. Also used the heart shaped seed cards for place setting. These measuring spoons each have a loving message on the handle and were a big hit at the shower! These already come packaged, so you don't need to do any extra work to make them look nice. I gave this as a favor for a bridal shower. People really seemed to like it, as the measuring spoons can be quite useful around the house. The material used to make the spoons is not the best quality, but nonetheless is still good. Overall great value. So cute as a shower gift! We used these as favors at my best friend's bridal shower. They were a hit! Great quality, cute, and practical. Everyone was pleasantly surprised when they saw the favor that graced their plate at the bridal shower. Attendees commented that for once something useful. I was very pleased with my choice as was my daughter the bride to be. These heart shaped measuring spoons which were the favors at my daughter's bridal shower, were a big hit. Everyone thought they were adorable, yet functional. We ordered a half dozen small items for the bridal party's shower and felt these small, but heart-shaped measuring spoons would not only be functional but meaningful too. it was a huge success!!! we had a wedding shower at work and i am constantly trying to get new and creative things to give a sa gift and fits the occassion...these heart shaped measuring spoons were lasting impression of the shower that everyone is still talking about! Thank you Beau-coup for always having what i need at a great price!!!! I used it as a favor at a bridal shower of sorts. They all loved it! The guests loved them. We put them in a big basket and had the flowe girl hand them out. Even the flower girl, who is too young to really cook, could still play with them in her little play kitchen. Very cute idea that required no work and not a lot of money. It was definately a cute gift that people will get to use. I got several of these to give as prizes for the games at the wedding shower I am giving. We used these at my daughters bridal shower, added to flower pot bread they were a great shower favor. Everyone loved these at the bridal shower and they went well with the recipe cards that were sent out with the invitations. The only concern was that a lot of the guests questioned whether or not they were accurate measurements. I'm still not sure if they are but they can't be that far off! I also saw these at a lot of party stores for double the price! These spoons were given to everyone who attended my daughters bridal shower. Everyone remarked how they loved them and the beautiful phrases about love inscribed on each spoon. I have since used them in baking. They are really a unique item that people can use and makes you smile when baking for those you love! I gave these out as game prizes for my sister's shower/bachellorette party - they were a hit! I was glad I ordered enough so that everyone got one. Besides, the price is right; I saw the same spoons at [...] for over $10. I gave these out as a favor for a bridal shower. All ages enjoyed receiving this gift. very cute although i'd take it out of the box if using it as a favor. These perfect heart shaped measuring spoons are unique, classy, fun, great quality and very fitting for any Wedding affair. They will make a perfect gift for a Bridal Shower game winner! My niece "the bride to be" will be receiving one of each favor that I have purchased from beaucoup. Shhh...she doesn't know it just yet. She previewed the favors and she LOVED them all! I can't wait to see the look on her face when she opens her gift bag full of these beautiful heart favors from beaucoup! This is very cute but I am not sure how practical it is. But it was a nice touch. These were very very cute. I only gave the measuring spoons a 4 star rating because of the quality. They are functional and usable, but not as thick as the solid stainless steel spoons I use at home. They are worth the price but just know before you buy that you'll get what appears to be a stainless steel alloy that are a little thin. I would definitely still buy this item. The sentiment is great. 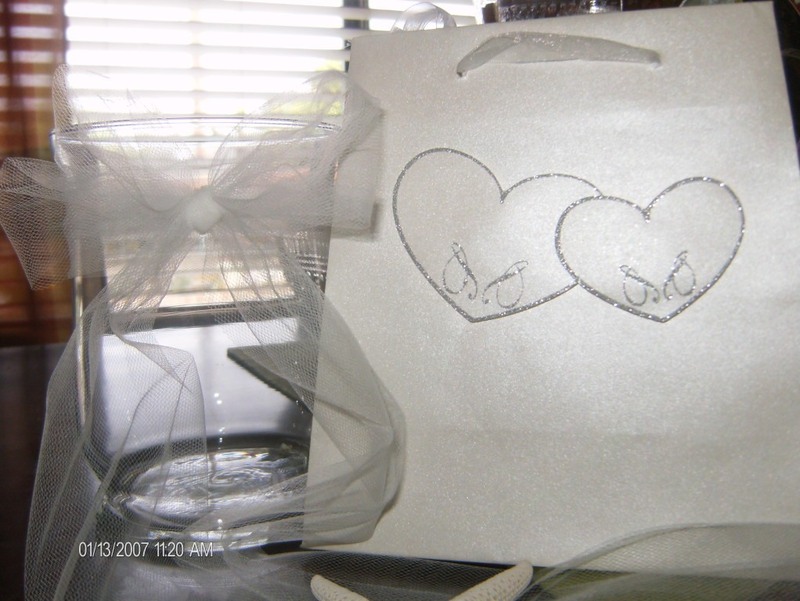 I used them to decorate and embellish the gift wrapping for our bride. She and all the guests loved the measuring spoons! The spoons are a happy reminder of the bride, and I will be use them daily for life! You can't get better than that. I *heart* the measuring spoons! I *love* these heart measuring spoons! So cute, functional, great quality, and perfect gifts! Very useful favor and at a very good price. Good quality. HAPPY HEARTS from gifts of spoons. Each response to the gift of the Heart Shaped Measuring spoons was one of delight, which in turn pleased me. The product was very good quality for the price. It was a unique choice that I could afford to buy for multiple people and it was very well liked by the reciepents. I'm using it as a party game prize. Very cute! The packaging on this product is very nice. I am going to use this as a favor for my sister's Bridal Shower. Price is good. Quality is good. These spoons added a dollop of love! I baked bread, wrapped it pretty and attached the recipe with the heart measuring spoons. An inexpensive way to express your love from the heart and kitchen! This is a shower favor gift that will continued to be used by every guest. Great quality for the price and the pharases engraved on each spoon are just adorable. Packaging is very cute as well. Great idea for game prize! This was a prize gift for a game at a Bridal Shower. The bride's wedding theme was Two Hearts, One Love. This fit perfect for her theme. Cute reminder of "Recipe for happiness"
I love these spoons! They are cute AND useful- what more could you want! We had a baking/cooking theme for my daughters shower. We attached the spoons to a sugar cookie cut of a chefs hat. Everyone loved them and it was the perfect favor. Great memento of a bridal shower at a good price - functional, too. I loved the packaging - simple yet elegant. I highly recommend this product and company!! Perfect present for a bridal shower. Good quality, useful, heart shaped, reasonable; it was a very good buy. These were very nice, and a great gift for games at a wedding shower. I am using these favors for a Girlfriends Valentine Tea Party that I am hosting for all of my "girlfriends". I am attaching a poem entitled "A Recipe for Friendship." These measuring spoons pull the theme all together. The measuring spoons are just perfect, good quality and they make a great favor. This is a cute favor. My guests say they use them all the time. The quality is good and the price is great. Plus- they come in a cute little box! great favor for "recipe shower"
The absolute best gift to give. Product is practical and a great memory of the occasion. Every time the spoons are used, you'll think of the bridal shower and the bride/groom. I used these as favors for my cousins bridal shower...they were a hit and a great value. Two years later and I am still using these in my new kitchen. I got these spoons for my sister's bachelorette party and they were a hit! Everyone thought I'd had them hand engraved! The boxes the spoons came in were really nice, but I took them out of the packaging and tied the spoons with ribbon around the cupcake mix box (also a great gift). Fantastic favors for a wedding shower or bachelorette party. Thank you! Surprised at how cute this was. We purchased this item for my daughter's wedding shower as a favor. Everyone loved them! In fact some people took a couple since I over-ordered (as they say better to have too much right?). They were great because they came wrapped pretty with a bow and a card which saved us tons of time. We were very happy with the product! We bought these as a favor for my sister's bridal shower, and everyone loved them. Not only are they very cute and a bargain, but definitely practical. And, my sister in particular was touched, as she is known for her baking, and this favor really would remind people that it was from her shower. These measuring were the perfect favor for a kitchen themed bridal shower. All the guests loved them because they are adorable, yet practical and useful and a nice reminder of the day long after. The packaging and presentation when the shipment arrived was outstanding. It made me wish for another event to use your company. Well done - thank you. This set of spoons makes the nicest memento gift. When several small gifts a year are needed, this is the one. I chose the measuring spoons because my step-daughter loves to cook. They're unique, useful, and have "measures of love" on each spoon. Everyone loved them! They come beautifully boxed with a bow and ready for the table or gift basket. I would highly recommend this favor for showers and weddings. I ordered these for my best friends wedding shower and it was the perfect gift as favors for the guests since Katie (the bride) works as a recipe developer for Kraft foods. The mother of the bride was very impressed with the quality of the spoons (stainless steel) and everyone loved the packaging and the little sayings on each of the spoons. LOOKING FOR A BRIDAL SHOWER GIFT? These were loved by all! Great bridal shower favor. Beautifully wrapped and very practical. I would highly recommend this item, especially if you want to give a favor at a bridal shower! We All Loved How Practical They Were! I use these measuring spoons daily. They were a complete hit, no one had seen anything like them! I have ordered both the wire whisks and heart shape measuring spoons. I tied them to cookbooks that were personally created for 2 bridal showers that I was one of the hostesses for. The favors were a big hit and the both products made for a very special keepsake. This went in our gift bags & were a big hit. Very cute. Only con, the price adds up. The measuring spoons were a hit at the bridal shower. Everyone seemed to appreciate that it was something they could use, and that it would remind them of her wedding for years. These measuring spoons are cute, and go well with the other heart themed baking items. Again, the packaging them come in is cute in the picture, but cracks and breaks during shipping. They are a little over priced, and will need additional packaging in order to be used as a gift. Q:What is the material that the spoons are made of? A:This item is made of thin metal. A charming favor idea for your wedding reception or bridal shower, this set of heart shaped measuring spoons is designed with the happy couple in mind. 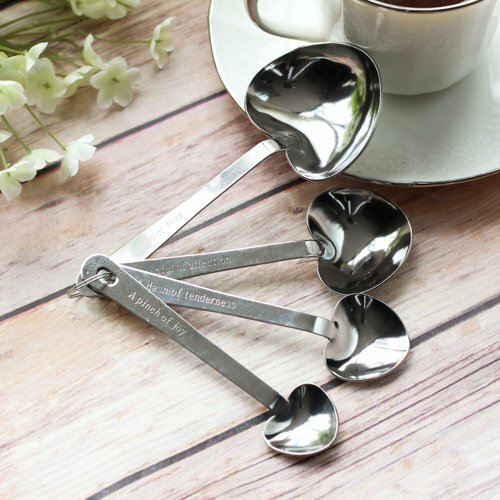 Four clever and romantic phrases (A heap of love, A spoonful of affection, A dash of tenderness, A pinch of joy) are engraved on the handle of each measuring spoon. The traditional measurements (1/4 teaspoon, 1/2 teaspoon, 1 teaspoon, 1 tablespoon) are engraved on the back side of the handle. Heart shaped spoons are made of stainless steel and thus, will not tarnish over time. This is a lovely keepsake that your guests will be able to use, and think of your special day, for years to come.